SANTIAGO, Chile -- One former Chilean soldier said he shot 10 people in the head and then blew up their bodies with dynamite. Another said his platoon drenched two teens with gasoline and set them on fire. Both confessions made publicly this year have shocked Chileans with details of crimes committed during the Andean nation's bloody 1973-1990 dictatorship. Human rights groups and families of victims believe they are a clear sign military pacts of silence that have hushed up many of the atrocities committed during the rule of Gen. Augusto Pinochet may finally be unraveling. "Criminals can't take the guilt any longer," said Veronica de Negri, whose 19-year-old son, Rodrigo Rojas, was burned to death at a 1986 protest against Pinochet. "They're going to continue coming out. It's a domino effect. More and more will talk." For nearly three decades, many perpetrators enjoyed impunity. But after a former soldier testified this year about Rojas' killing, in July a judge charged seven ex-soldiers with the attack, which also severely burned another teen, Carmen Quintana. 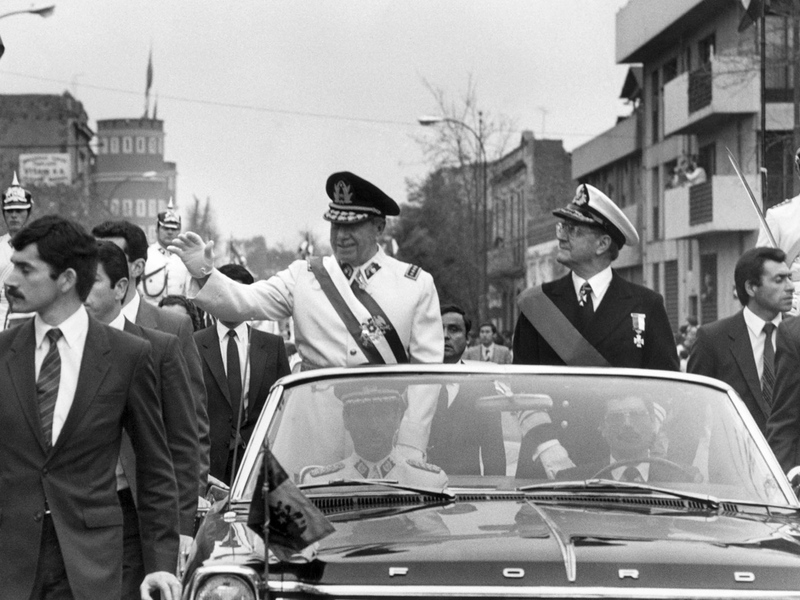 U.S. documents published this year indicated Pinochet covered up the military's role in the slaying of Rojas, who was a U.S. resident visiting his native Chile. The case drew worldwide condemnation and strained the regime's relationship with Washington. The latest confession came early in December and took Chileans by surprise: It happened during a radio show that usually focuses on personal anecdotes, some humorous, some serious. Using the name "Alberto," the caller first said he wanted to share a love story. He then launched into a much darker tale. He said he was an army veteran and recounted taking several people to the desert, shooting them in the head and blowing up the bodies. "Not even their shadow was left," said the man, who expressed regret about killing at least 18 people in various incidents. Days after the 25-minute call, the man, identified as Guillermo Reyes Rammsy, was arrested. A judge ordered him held under house arrest while the case is investigated. Attempts to reach Rammsy were not successful. "These people carry feelings of guilt," said Giorgio Agostini, a forensic psychologist. "Speaking about it, in this case publicly, gives them some sort of release." At least 3,095 people were killed during Pinochet's dictatorship, according to government figures, and tens of thousands more were tortured or jailed for political reasons. Pinochet died in 2006 under house arrest without being tried on charges of illegal enrichment and human rights violations. Retired Gen. Guillermo Garin, who was the army's second-in-command under Pinochet, says the number of victims has been exaggerated. He also denies the existence of any pacts of silence. "I was very close to General Pinochet," Garin told the AP. "The president was busy governing the country and was not involved in anti-subversive fights or combatting clandestine organizations." But ample evidence points to Pinochet's involvement and to his orders for cover-ups. U.S. documents published recently show Pinochet covered up the military's role in the burning death of Rojas. Declassified State Department cables from 1986 cited a source within Chile's national police force who said a report on the attack was presented to Pinochet, who refused to take it and rejected ordering an investigation. At the time, Pinochet accused Rojas and Quintana of being terrorists who were burned by firebombs they planned to use against barricades. Punishment for dictatorship-era crimes has been sparse. The government's human rights program says 1,373 former and current military members have faced trial. Of those, 344 have been convicted, and most of them were sentenced to house arrest or some other form of non-jail punishment. While the trials have led to some revelations about the regime's abuses, human rights groups believe there is much more to learn. Former Supreme Court President Sergio Munoz, who oversaw special judges handling hundreds of dictatorship cases, says members of the military have gone to great lengths to remain silent about the crimes. He hit roadblocks in some investigations and often there was "deficient cooperation among institutions," Munoz told The Associated Press. "Chile would benefit a lot from say, choosing 20 former military draftees and letting them go unpunished in exchange for information," said Marta Lagos, a political analyst. Fernando Mellado, who heads a group of former recruits who served during the dictatorship, said more ex-soldiers would be willing to provide information if they didn't fear being jailed. He said many young soldiers were "just kids" taking orders. Attempts by some former military recruits to reach an immunity-for-information deal with the Ministry of Justice have failed. "If the state frees us from responsibility, I think we'll talk without a problem because we are not the only ones responsible," Mellado said.